Monkey bread. Monkey bread. I dare you to say it and not giggle. I didn’t even know this wonderful food existed until recently. Our friend Eric brought a loaf to a potluck party, and it was an enormous hit. The bread itself was a humble and unassuming thing: bite-sized balls of yeasted dough, nestled together in a loaf and baked. It was perfect stand-around-and-chat food, made for idly pulling apart with one hand while holding a glass of wine with the other. Even on a table crowded with homemade treats, that monkey bread was a clear winner–it disappeared in record time. And I was smitten. I’ve since seen recipes for monkey bread all over the internet, in a dizzying variety of forms and flavors. The most common version seems to be a sweet breakfast bread, where the dough is soaked in syrup or caramel and the bread itself is baked in a bundt pan and inverted onto a plate. But the monkey bread I fell in love with was savory, as is the recipe that intrigued me the most in my internet ramblings. 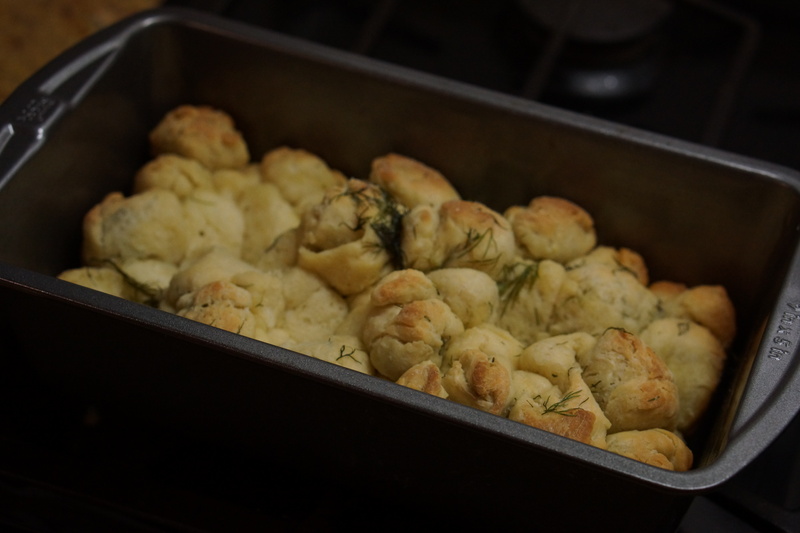 This is a richer, more sophisticated version of Eric’s simple monkey bread, made from scratch with a springy egg dough, fresh dill, and a whole lot of melted butter. This is the quickest and simplest yeast bread I’ve ever made. From start to finish, the whole process took just over two hours–and that was on the coldest day of the year, so that the dough took twice as long to rise as it usually should. The dough requires very little kneading, rises for only a brief period of time, and bakes surprisingly quickly. The messiest–and yet most satisfying–step involves dunking the individual balls of dough in dill-spiked melted butter, then layering them in a loaf pan. By the end of the process, my hands were slicked with butter and fragrant with dill, which was almost as fun as eating the finished bread itself. Then all it takes is a sprinkle of flaky salt and a quick trip into the oven, and you’ve got fresh, buttery bread that can be eaten without a knife. For a sit-down dinner or a stand-up party, this is a treat worth making. But you know what? It’s almost Christmas, the perfect cookie time, and these are so simple and sophisticated and the perfect shade of festive green. So I’m sharing them now, and I’m pretty excited about it. These are the second green tea cookie recipe I’ve tried so far, and like the chocolate chip cookies, they’re a real winner. They’re based on a French shortbread, or sablé, recipe, lightened up with cake flour and just a touch of baking powder. The resulting texture is sandy and rich like a good shortbread, but without the lingering graininess: these cookies really do melt in your mouth. The matcha powder stains the dough a deep forest green, and if you taste the dough raw–which I cannot confirm or deny that I did–you might think the flavor is a little too intense. 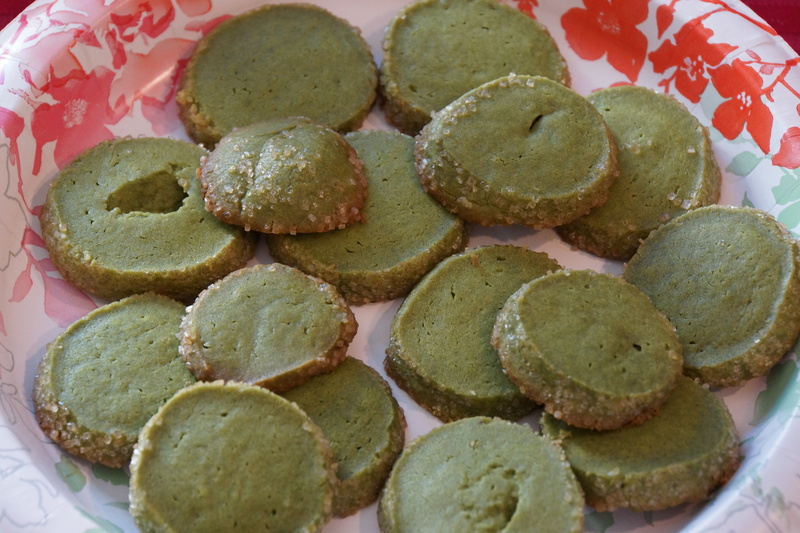 But in the oven, the color softens to a mossier green, and the green tea flavor becomes more delicate. Rolling the dough in coarse sugar is an optional step, but I highly recommend it, as the slight crunch around the outside of the cookies makes them even more elegant and lovely. As I’m writing, I can’t help thinking that this is a terrific Christmas cookie recipe. The dough comes together in a matter of minutes, and once it’s been shaped into logs and chilled for a couple hours, you can simply slice off and bake as many cookies as you like. It also seems like a fairly kid-friendly recipe, since you could put small hands to work helping shape the bright green dough and roll it in sugar. And finally, like so many shortbreads, this seems at its best when eaten indoors on a cold winter day, possibly dunked into a mug of hot cocoa or–you guessed it–green tea. 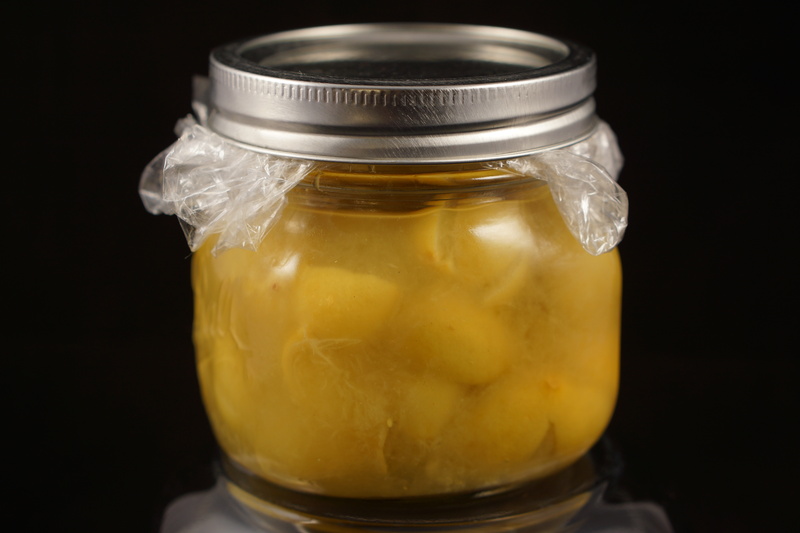 When life hands you lemons, make preserved lemons. And then put some in this stew. This came about as a happy accident. I found a very old bag of cranberry beans in my cupboard, and was feeling in the mood for a one-pot meal. I had my trusty jar of preserved lemons, and a strong craving for something with greens. We’d gone to a local meat market and deli earlier in the day for lunch, and they had a terrific price on chicken legs. 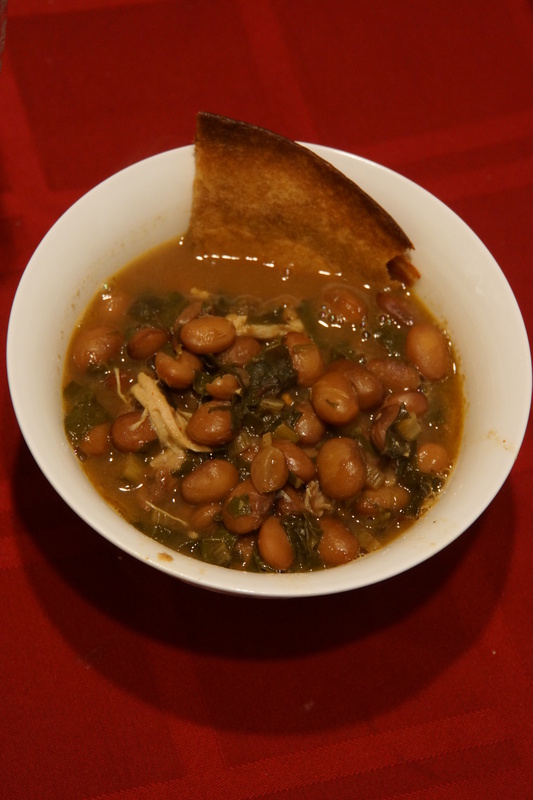 And so dinner took shape: a bubbling braise of beans, chicken, and chard, flavored like a classic north African tagine. The result was a little more brothy than a tagine, and so I’m calling it a stew. But whatever you call it, it’s a wonderful winter meal: warm and soothing, rich with spices and starch. The preserved lemon adds a pop of brightness and a salty depth, and the beans thickened the broth to a lightly saucy consistency. As Audrey said, it felt like the perfect meal to eat if you were feeling under the weather; it tasted like it could cure a lot of ills. Another reason I love this meal is because it uses meat as a flavoring, rather than the main attraction. For six people, I could have easily bought three pounds of meat; but I decided to go with just a pound of bone-in, skin-on legs, and stretch them a bit. I browned the pieces in oil, then simmered them in the pot along with the beans; then, when the flesh was lush and tender, I pulled the chicken from the pan and shredded the meat to be stirred in at the end. The bones and browned skin contributed flavor to the braising liquid, as if it were a stock; the meat provided little pockets of chew in between the creamy beans and slippery greens. I said this was a one-pot meal, and it easily could be. But there’s a fair amount of rich liquid involved, and for my money you really need something to soak it up. I made a quick whole-wheat flatbread to dunk in the bowls, which was a real treat. But I could also imagine putting a heap of warm couscous in the bottom of each bowl and ladling the stew over that. Either way, you’ll be looking at dreamy faces and full bellies by the time this meal’s over. Until recently, my friend Sarah lived in a house with an abundance of fruit trees. There were a number of prolific citrus trees, including two or three lemon trees. Most of the lemons were ordinary palm-sized things, but there was one tree that was a little…odd. Through some combination of genetics and trauma, it only produced miniature lemons. I don’t think any of us had seen lemons like these before: small and round, with paper-thin skins and greenish flesh. They were surprisingly juicy for their size, but we could still only squeeze a thimbleful of juice from each lemon. They were adorable, but not especially useful. 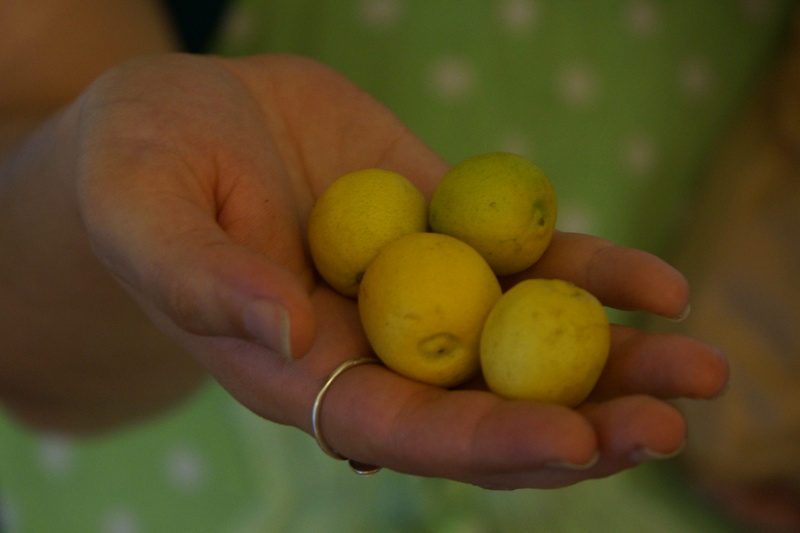 A couple months ago, Sarah harvested a box of tiny lemons from her tiny tree, and then stood around in the kitchen at a complete loss for what to do with them. I’m a sucker for tiny adorable foods, so I jumped in and volunteered to take them home. My solution? Preserve the lemons whole. Preserved lemons–salted, fermented, and minced into a gooey paste–are a staple in North African and (I believe) Indian cuisine. They’re best known as a partner in crime with chicken and olives, usually in the saucy spiced braise known as tagine. They’re not always easy to find in stores, but they’re dead simple to make–if you’re willing to wait a month. Ordinary lemons (preferably on the smallish side) will work fine; Meyer lemons are highly recommended; if you can find dwarf lemons like the ones I have, they make terrific single-serving portions. The process is similar to when I made kimchi a while ago: you cut lemons into attached wedges, fill them full of salt, then pack them into a jar until they release their juices. Let them sit for a few days to start the fermentation, then top off the jar with lemon juice and stash them in a cool dark place until the fermentation is complete. Like kimchi, what you end up with is a powerful and strangely compelling condiment. The lemons become slippery and squishy over time, losing their harsh edge and gaining something darker and funkier in return. In a strange reversal, the flesh becomes bitter and the rind turns fragrant; you can cut away the flesh and just use the rind, though my lemons are small enough that I just cut up the whole thing. Stir them into any long-simmering soup, stew, braise, or curry to add a burst of rich lemon flavor, without the acrid tartness of fresh juice. There’s also an extra bonus, which I wasn’t expecting: the lemon brine. Because of the pectin in the lemon peels and juice, my brine thickened to a soft goo, sort of a cross between a syrup and a gel. It’s incredibly salty, and in fact, I’ve taken to seasoning things with lemon brine instead of salt. It’s terrific as a last-minute addition to a simple vegetable soup, or whisked into a salad dressing. Two seasonings for the price of one–not bad for a crop of freak lemons.